Bringing a new puppy home is an exciting event for humans, but for cats it can seem as if their world has just been torn apart. Even if your cat has been used to living with a dog, the new puppy is nothing like their old, established friend, and can seriously disrupt the household order! Here are some tips on introducing your puppy and cat. Most cats are highly territorial, and routine-oriented. The inner sanctum of their home is an important part of their security, and feeling that it has been ‘invaded’ in any way can be enough to trigger off a whole gamut of stress-related behaviours – including spraying urine on your furniture, leaving deposits in your shoes, or the dog’s bed, or – at worst – leaving home altogether. Preparing your home for the arrival of a new puppy is very important, but even more so if you have a cat (or cats) and want to make the arrival as calm and harmonious as possible. Simply bringing your puppy home, popping him on the floor, and allowing him to chase (or be chased!) across the carpet is not the best first introduction! Indeed, in one fell swoop it can create anxiety and a mistrust that can last for life. Introducing a new puppy to an established cat really requires you to think about the world from your cat’s point of view. Cats see the world in very different ways to humans – and to dogs! While our world is full of vision and colour, cats tend to gain much of their information from scent, which is why even a new piece of furniture in your home can be enough to upset a sensitive feline disposition! For this reason, accustoming your cat to the smell of your new dog, long before he or she even comes home, can be ideal. 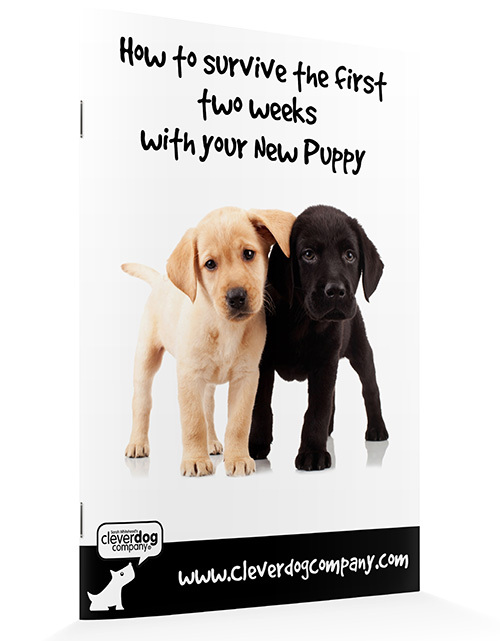 This can be done by taking a cloth with you when you visit your new puppy at the breeder’s and stroking the puppy with it. You can then take this home and wipe it on your furniture, door frames, even your own hands, before stroking your cat. This way the smell of the new puppy will be transferred to all these areas and will be familiar to your cat before she ever lays eyes on the newcomer. Perhaps this is the cat version of seeing photographs of someone before you meet them – giving a much-needed sense of recognition in advance. Once your pup is home, spend lots of time stroking your cat before immediately stroking your pup – he or she will then smell familiar and will be recognised as a part of your cat’s family. With the imminent arrival in mind, think too about the practical areas of your cat’s life that may be disrupted by the presence of a new puppy. If you currently feed your cat from dishes on the floor, you may choose to start getting her into the new habit of eating up on a high surface. This is for two reasons. The first is obvious – a dish left down with food in it will be eaten by your dog! Cat food is not good news for puppies for many reasons, and it certainly won’t help with house training if your new pup has a stomach upset in the first few days. The second reason is that your cat’s emotional security needs to be protected and she may well feel vulnerable eating on the floor with the possibility of a bouncy puppy suddenly appearing next to her (or on top of her!) while she eats. Have a think too about the positioning and type of litter tray that your cat uses. If this is in a place where the puppy can access, you need to be aware that cat poo is a doggie delicacy! This might be a perfectly ‘normal’ canine behaviour, but clearly it is unhygienic, and pretty revolting! However, far worse from your cat’s point of view is the fear that she might be ambushed by the puppy whilst using the tray! Even if your puppy does this in play, this has got to be top of the list of feline nightmares, and can lead to all kinds of messy behaviour problems in the future if your cat no longer wants to use the tray. Of course, no one likes the thought of being surprised by the door suddenly opening whilst we are at our most vulnerable in the loo – and the same goes for cats too. To avoid this, you may need to re-position the tray somewhere that only your cat can access, whether via a cat flap or the judicious use of a baby gate or barrier that your cat can get through or jump over, but your puppy cannot. Various types of litter tray can also help to prevent canine interest in the contents – the type that are covered with a domed lid, and are accessed by a cat flap can be ideal, but you need to accustom your cat to using a new tray before the arrival of your new puppy, not after! 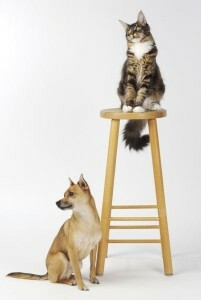 On the whole, cats are wily creatures that work out very quickly that where they can go, puppies cannot always follow. However, in order to feel safe and secure it’s important that they have high places that they can go to sit and look down on the new puppy in a superior, feline kind of way. For this reason, make sure that your cat has access to window sills, units, even bookcases, where you won’t be worried about ornaments getting knocked or your cat struggling to climb up or down. How much your cat will need to use these ‘safety platforms’ will depend largely on his or her basic confidence, but even if you think that your cat is usually a big, bossy bruiser, it’s best to provide some of these high-rise hides in advance. Without doubt, one of the main contributors to a harmonious cat and dog household is to ensure that your puppy never gets a chance to chase your cat, either in the house or the garden. The easiest way to do this is to create barriers in your home that your cat can traverse but your puppy can’t. Baby gates (where the cat can slip through the bars, but your puppy can’t) or low barriers positioned at doors or the bottom of the stairs where the cat can easily jump over, leaving your pup on the other side, are simple and practical. Keeping your pup on a lead or trailing line is also recommended when you are there to supervise interactions. Combining this with training a ‘settle down’ on command can work wonders to keep everyone calm and happy. My experience of keeping dogs and cats together has been a wonderful joy. Whilst there is little doubt who rules the roost in my house, (as all those who are ‘owned’ by cats will know,) to see all my animals lounging together on the sofa, or lining up for a spot of clicker training en masse, has been a huge privilege – and, quite simply – great fun. There are some cases where despite your best efforts, your cat and dog still aren’t getting on. This might be because your cat is very anxious or fearful, and is hiding the whole time, or it may be because your new dog shows an inherent desire to be ‘predatory’ around your cat. This is normally seen in older dogs, rather than puppies, but tends to be characterised by the dog being obsessed with your cat, sniffing her out and hunting for her continually, or shaking with arousal and being completely fixed and focused when he sees her. Don’t delay. These kinds of symptoms indicate that you need some professional help with assessment and possible intervention, as the welfare of both animals is at stake – as well as your stress levels!